(Phys.org) —A recent press release by 3M announcing that its partnership with Nanosys, Inc. is about to bear fruit appears to be a sign that LCD's with quantum dot technology are close to fulfilling the promise of much more colorful displays. Not to be outdone, Sony recently began shipping its quantum dot enabled Triluminos television sets to stores, garnering rave reviews in the process. Quantum dots are very small bits of semiconducting nano-crystals—they're useful because they can be confined in three spatial dimensions allowing for very tight control of emitted light at precise wavelengths. Shining a light through them produces exceptionally pure colors—applying trillions of them to a thin film allows for the display of color richness never before seen with LCD devices. Researchers have been raving about the benefits of the technology for several years while manufactures have been promising that devices with the technology would soon become available to consumers. It appears that such promises are finally about to come to fruition. In its press release, 3M says the company is near the end of a process that will lead to scaling-up of its Quantum Dot Enhancement Film (QDEF). They add that the newly developed film will allow for creating devices capable of displaying 50 percent more color than LCD devices (phones, tablets, TVs, etc.) currently on the market. Such devices, they claim will be brighter, lighter and will use less energy than conventional LCDs. Scaling up presumably means delivering their technology to manufacturers for producing the film in bulk—the timetable given is "sometime late second quarter" which should translate to next month if all goes according to plan. The film is to sit inside the existing backlit panel in display devices, meaning that no other new hardware will be required. This they say should allow for an easy transition with current devices. In a broader context, the announcement means that device makers could conceivably begin selling phones, tablets and television sets with QDEF technology as soon as this year's holiday season. Sony's Triluminos television sets, in contrast, are available right now. 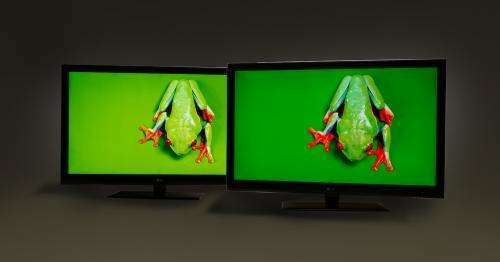 The company offer three models, all of which use quantum dots in their backlighting and all of which are price competitive, the company says, with traditional LCD based TVs. Sony has not revealed if the display technology inside the TVs will be made available for other types of devices. "...they're useful because they can be confined in three spatial dimensions..."